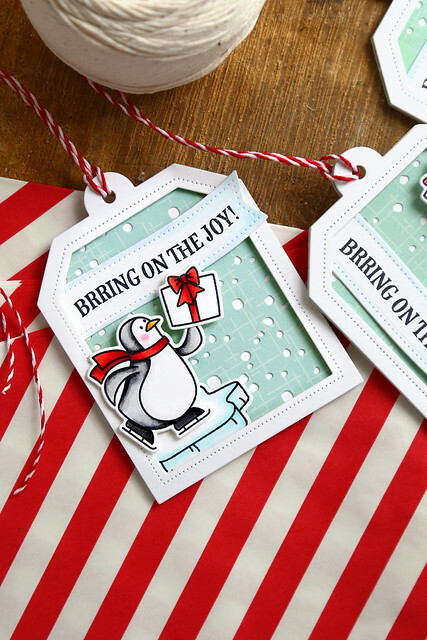 I'm on the Avery Elle blog today, with a fun card featuring the new set Brring On The Joy. Seriously, aren't they the cutest? With the ones on the end doing an odd jig and the one on top being tossed into the air? I love them! It's penguin-capades. 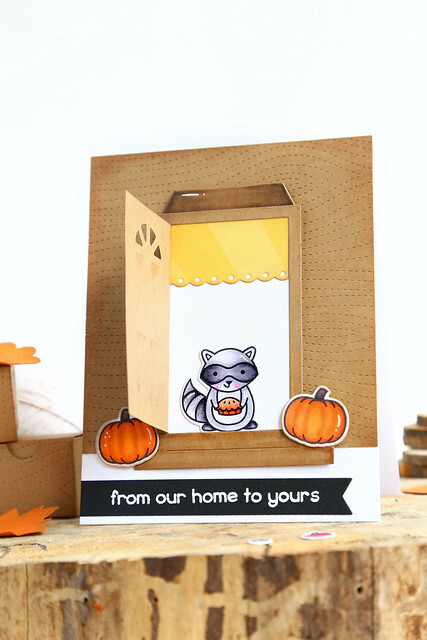 For more on how the card came together, and for a full list of supplies, visit the AE blog - click! 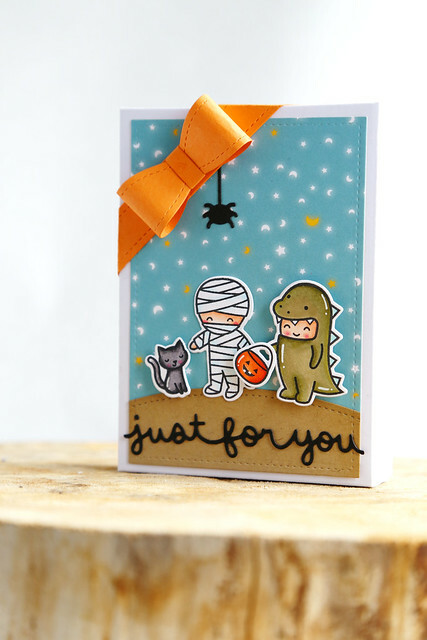 I paired it with images from Costume Party, and also used the new scripty Trick or Treat die for the sentiment. I cut the cobweb to make a smaller one on the right, and hung an extra spider from the greeting. I can't get enough of those cute trick or treaters! 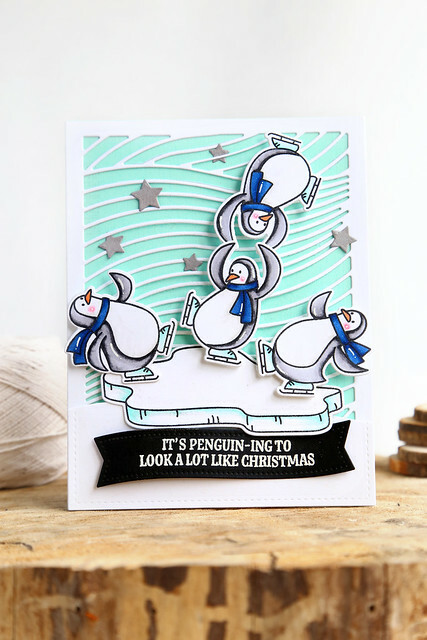 I hope you like my card for today, and if you want to see more from the design team, head over to the LF blog - CLICK! Welcome back to another day of this month's Lawn Fawn inspiration week. Are you excited for this release yet? 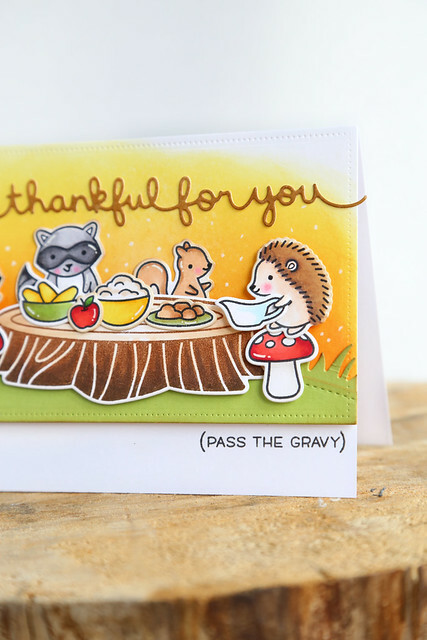 We're showing off Forest Feast, the cutest Thanksgiving-themed set ever! I love that giant tree stump. 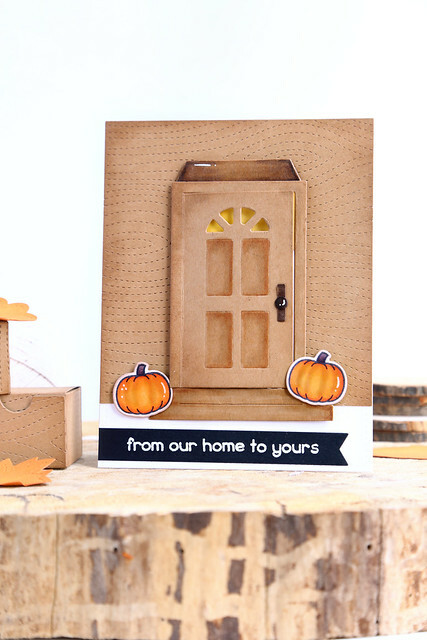 I wanted a very warm look and feel to the card, so I started out by blending different oranges on the base panel. I then stamped and colored all of the images, adding extra color and shading to the tree stump to make it look warmer and richer as well. 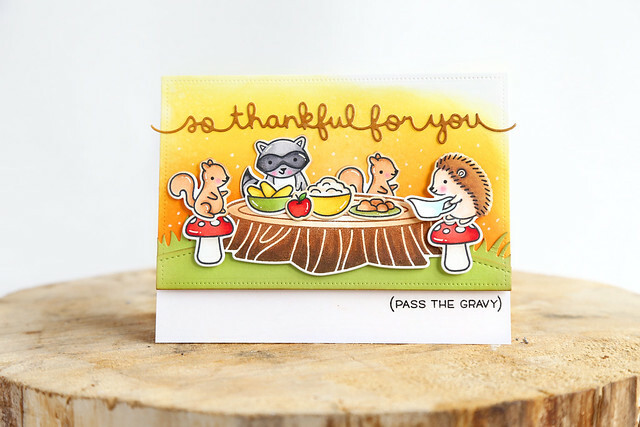 I love the little "pass the gravy" sentiment! I decided to tuck the gravy boat under the hedgehog's arm. I stamped him a second time on a piece of scrap paper and carefully trimmed out just his arm. I also added shading to the white border around all of the images to make them naturally fit the warm background. 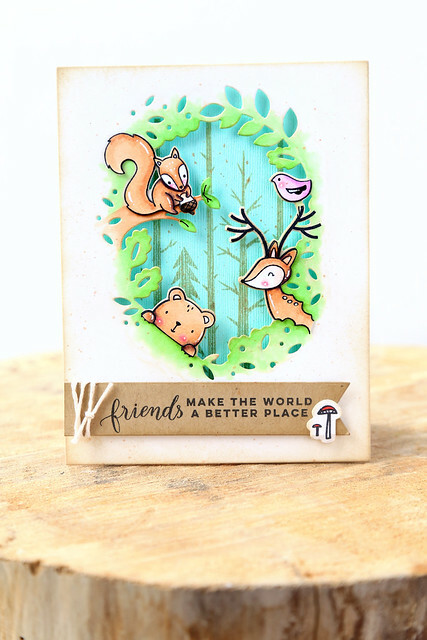 I fudged up a bit yesterday and forgot to schedule my Lawn Fawn inspiration week post. We were driving home from VA beach, where our family has enjoyed sun and sand and ocean water. Man, I could retire there. I wish it were closer than a 12 hour car ride away! I'll share my projects from yesterday and today in this one post. 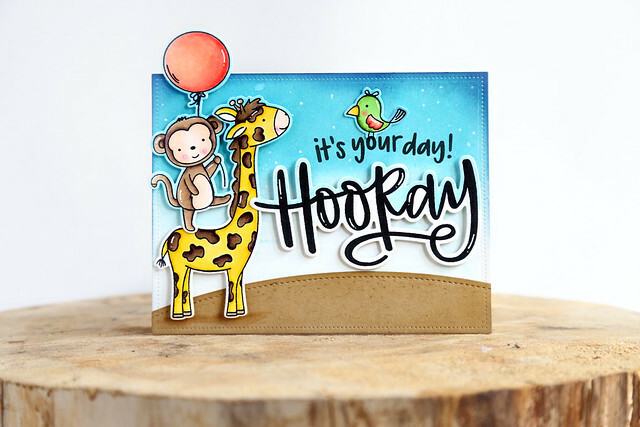 Today, we're showing off the new Stitched Woodgrain Backdrop die. I can't even begin to tell you how much I love it. You find this little guy waiting with a fresh pie. He is from the new Forest Feast set, and the pie is from Holiday Party Animal. You can see, from the box at the top, that the woodgrain doesn't quite line up (that is, you have to run the cover-plate through a few times to get the whole box to have the woodgrain look.) But I did get better at it after that first one. I think they look so sweet. 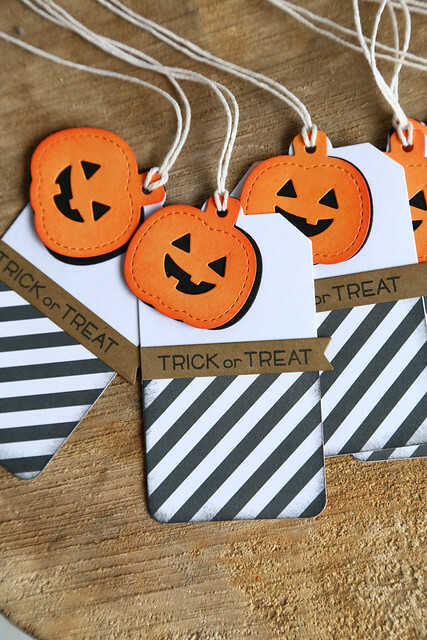 I used the new Fall Tiny Tags, and layered the pumpkins. The black layer is whole - I didn't run it through the die-cutter with the face. I did that only on the top orange layer, so that the face didn't look hollow. I like the depth that it gives. It features images from Costume Party onto the new Gift Box. It's such a great size! 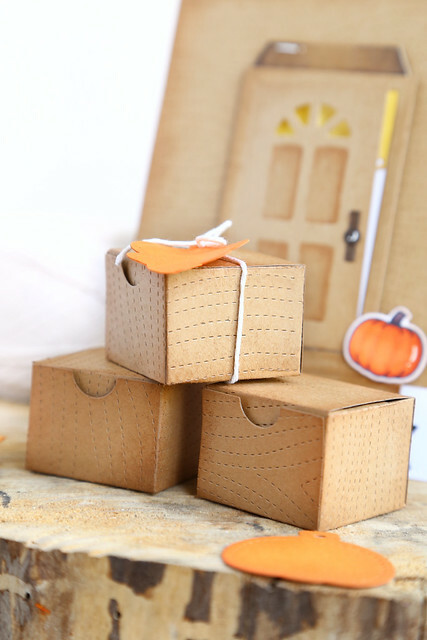 I love that I could create a whole scene on the outside of the box. Welcome back to another day of this month's Lawn Fawn inspiration week. 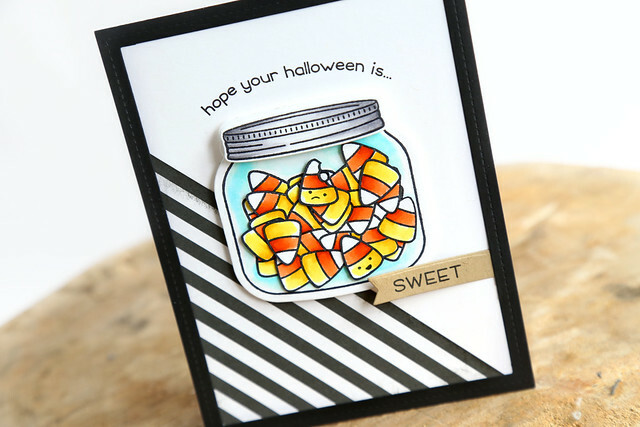 I'm not a huge fan of candy corn (read: that stuff is disgusting) but the new candy corn add-on set is seriously cute. It's a mini set, and designed to fit into the previously-released How You Bean set. I went with a classic candy corn/halloween black+white color scheme. 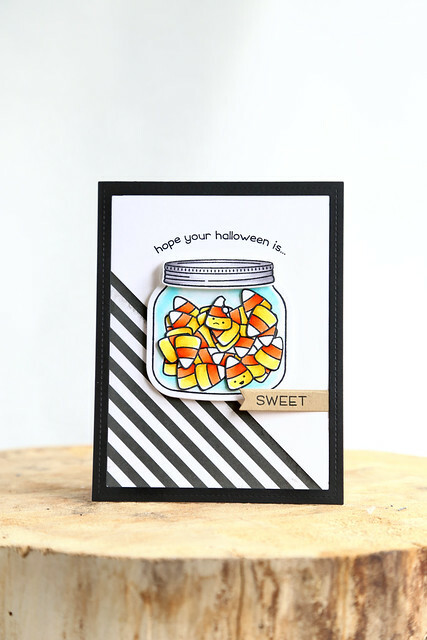 I stamped the big candy corn image directly into the jar, and then stamped and hand-cut another layer of them that I staggered slightly so that the jar would look more full. A few extras I layered on top of those, and added some faces to them. Poor little guy on top! Do you think his buddy on the bottom is more sympathetic, or relieved to have escaped a nibble? 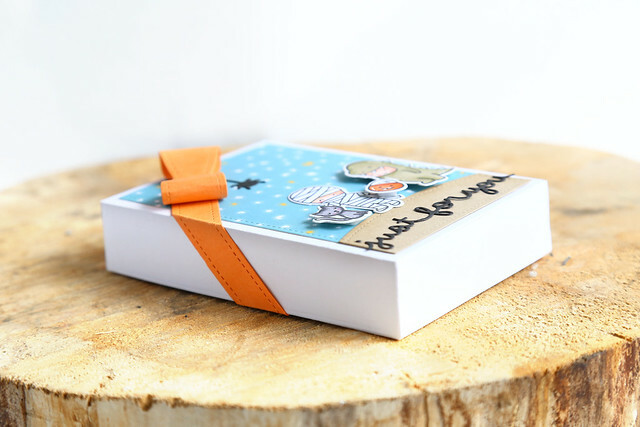 Check out the LF blog this morning for even more design team projects - click! It's time for this month's Lawn Fawn inspiration week. Their new release is so much fun! I don't know how they manage to wow after all this time, but I get so giddy when I open up my new Lawn Fawn boxes. Today, we're showing off Costume Party. 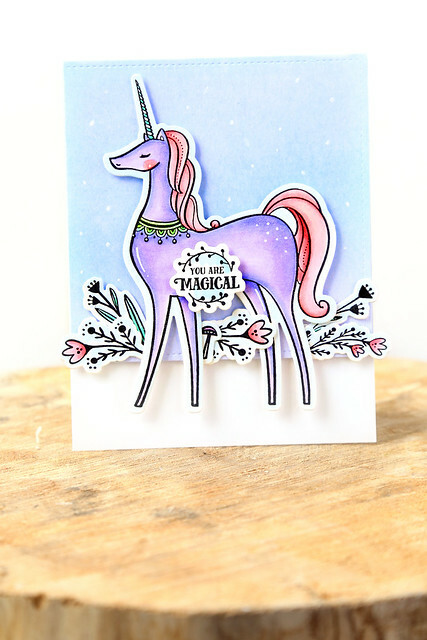 I posted this card to my blog last month for the sneak peeks, but Kelly Marie recreated it in a video on the LF blog this morning. Click over to see a step-by-step. I love these unicorns! 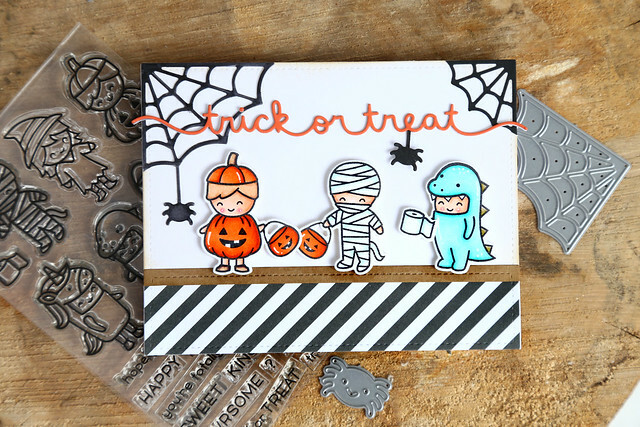 Any set that can be used for the halloween, but also year-round is a winner in my mind! I'm so happy to be able to announce that I will be joining the Pinkfresh Studio team. I love their designs, especially how innovative and whimsical they are. I created 2 cards to show you today. The first one uses my favorite set of their current release, Forest Friends. This set alone convinced me to say yes when Kinnari asked me to join their team! 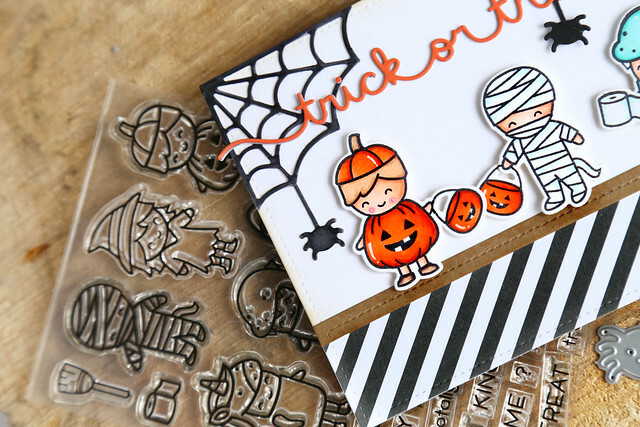 I used the matching die to create the layered scene, and stamped each image into its pre-designed spot. 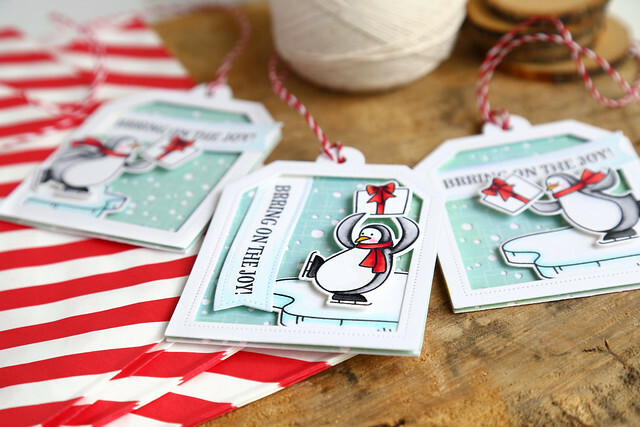 I also stamped the images separately, and used scissors to cut them out, to give even more dimension. To finish off, I used copic markers to add greenery and tree branch definition. 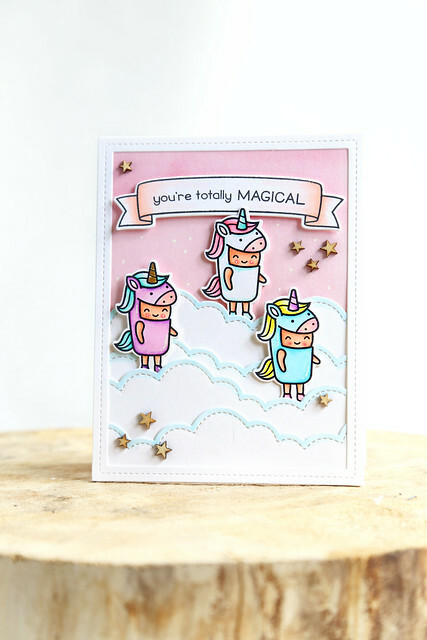 The little mushrooms that I added beside the sentiment come from another set, called Unicorn Dreams. I love how big this unicorn is! She covers the entire card-front, making figuring out a design so much easier. For a different look, I wiped off the ink on all of the florals inside the unicorn's body and kept her simpler. That allowed me to add the sentiment medallion right on top of the unicorn without it looking too busy. I stamped and die-cut all kinds of florals included in the set and set them at her feet. 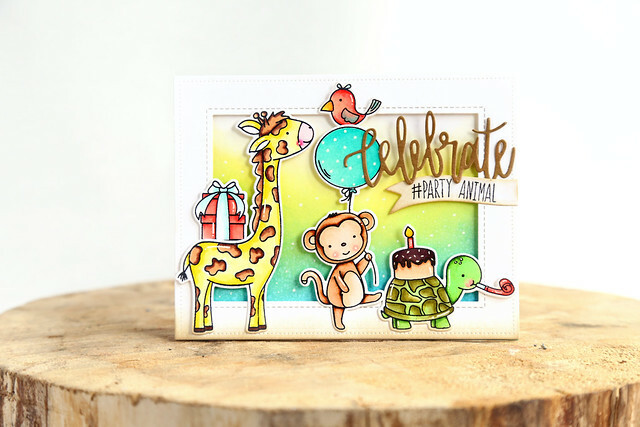 I'm joining the rest of the AE team for our new release blog hop! I've been doing monthly features as part of the team, but from now on, I'll be joining the rest of the team for the new release blog hops. I used the Falling Snow die on the bottom layer, and then used foam tape (so much foam tape) so that they would look good and layered. I love their different poses! I'm back with another Wild Ones card, to celebrate Neat and Tangled's 5th birthday. I wanted to use the little snake, since he has been neglected until now! 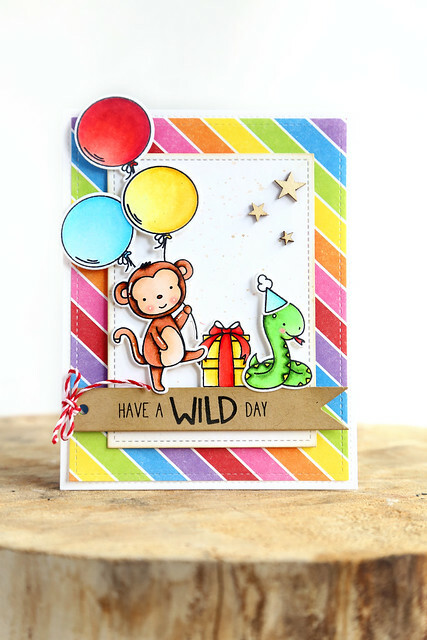 I stamped the monkey and added a few balloons to his bunch, and gave the shy snake a little party hat. 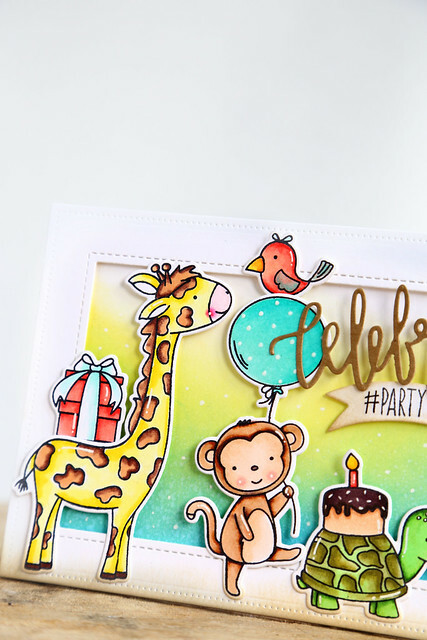 I punched up the party theme with a bright, rainbow-striped background patterned paper. I hope you like it! There's still time to enter my giveaway! Leave me a comment on any of this week's Wild Ones blog posts for a chance to win a 15$ gift certificate to the Neat and Tangled store. You have between now and Sunday, August 13th at 11:59pm EST to enter. 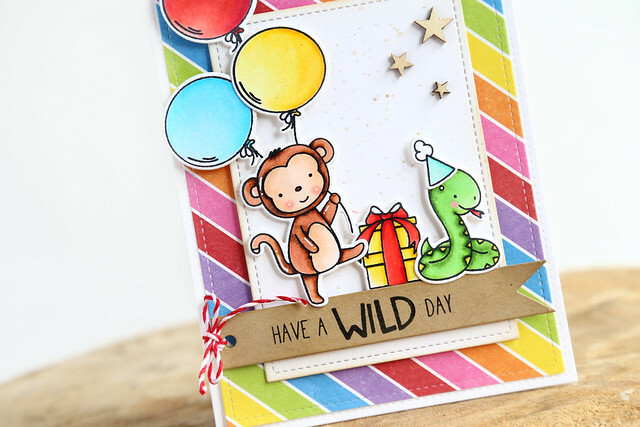 While I'm not taking part of the official blog hop list over at Neat and Tangled, I couldn't help but create a few cards using my new set, Wild Ones. I did some ink blending on the background piece, and flicked white ink onto the surface, before framing out the scene and adding the critters. I love the giraffe looking up at the little bird! I nestled the bird onto the monkey's balloon, and placed the presents onto the giraffe's back. I finished off the birthday parade with the little turtle. He comes with cake! 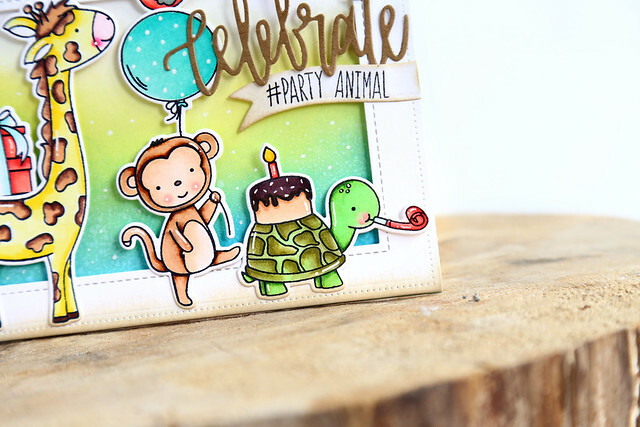 I used the Celebrate die-cut and drew on a hashtag sign to accompany the Party Animal sentiment that comes with this set. 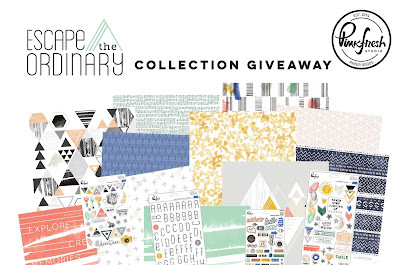 GIVEAWAY: I have a 15$ gift certificate to the Neat and Tangled store to give away! Leave me a comment on this post (and, yesterday's post too to increase your chances!) between now and Sunday, August 13th at 11:59 PM EST, and I'll pick a winner. For now, check out the Neat and Tangled blog this morning - click! Neat and Tangled 5th birthday celebration! I'm so thrilled to be part of the Neat and Tangled team, and especially when they are celebrating this milestone birthday. I was thrilled to be able to meet Danielle for dinner on our way down to Virginia Beach a few days ago. I wish either of us had remembered to snap a photo! But she is the sweetest and kindest person, and I am so lucky to be working for her. Happy 5th birthday, Neat and Tangled! For this birthday month, things aren't running in their usual way. The new sets are available for purchase right now instead of at the end of the week! And the regular design team has the month off to make room for special guests in a week-long blog hop. For more details, check out the NT blog this morning - click! 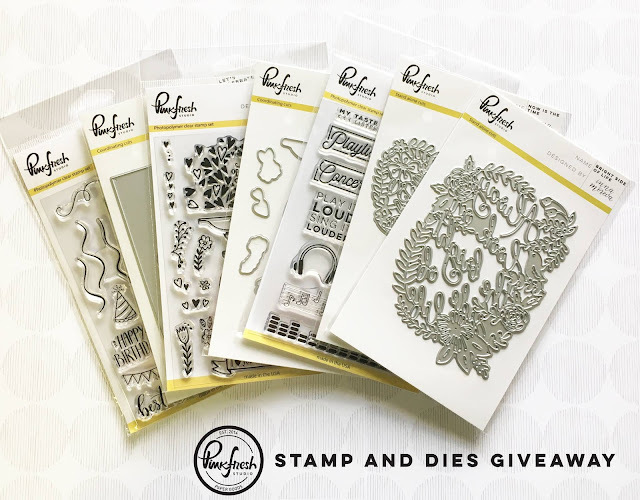 GIVEAWAY: I do have a 15$ gift certificate to give away on my blog! Leave a comment on this post between now and Sunday August 13th 11:59 EST and I will pick a winner. I illustrated a set that worked with our birthday theme, called Wild Ones. 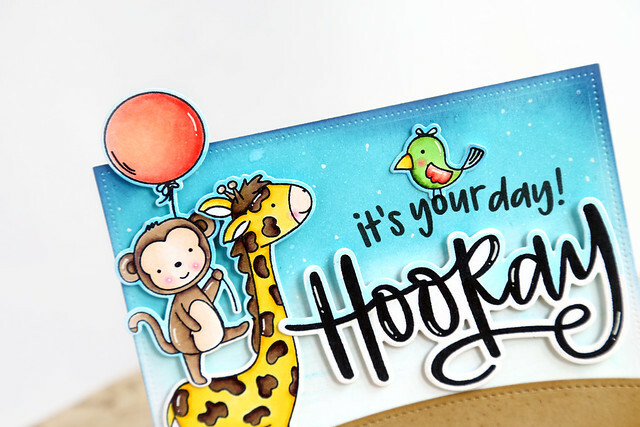 I couldn't help but pair the images in Wild Ones with the new hand-lettered Hooray. All of the products released this month work so well together! I did some simple ink-blending at the top of the folded card, and allowed the color to fade to nothing before grounding the images with a kraft-colored hill. 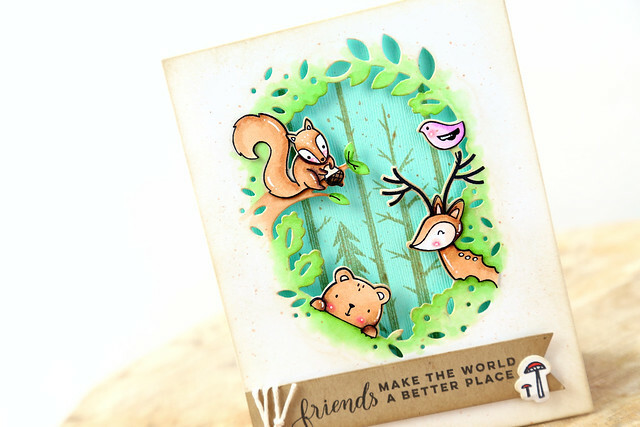 When I added the critters and the big HOORAY die-cut, I blended them into the background by coloring the outline around them blue wherever they would be sitting on the blue-inked card-base. I hope you like it! The giraffe and the monkey make me smile so big! Every year when my older kiddos come home from camp, I try to have a surprise waiting for them. This is their 3 year as sleep-away campers, and I love baking and decorating a little something to show how much we missed them. Their first year, I welcomed them home with a watermelon party. Their second year, it was an owl theme. 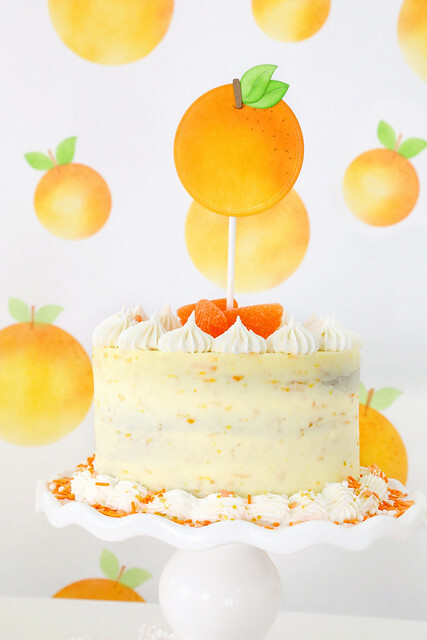 This year, we got a little punny with an ORANGE YOU GLAD! themed-party. 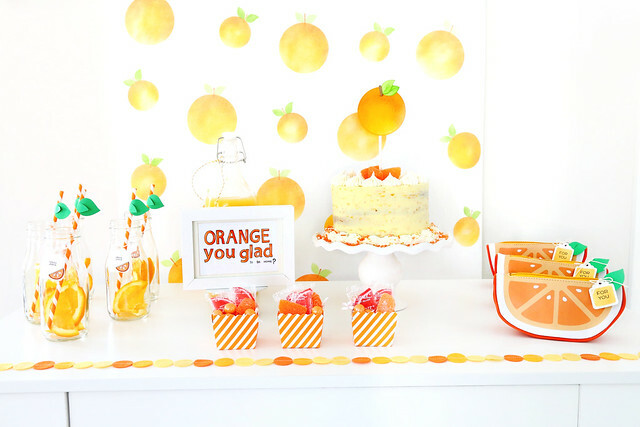 I used Lawn Fawn products to create all of the paperie for this party, including the backdrop, which was a breeze to make! 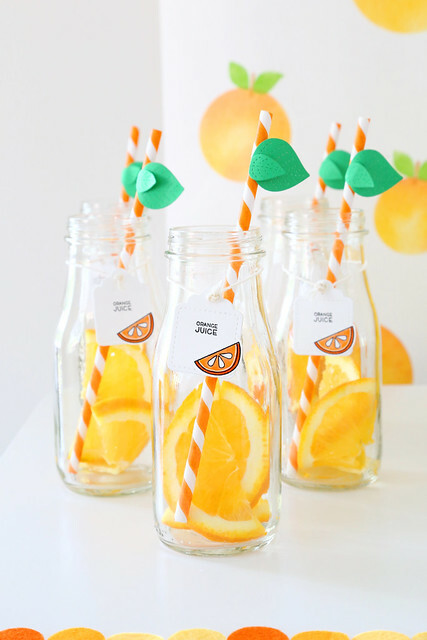 I sliced up a few oranges and slid them into milk bottles for an extra pop of color. 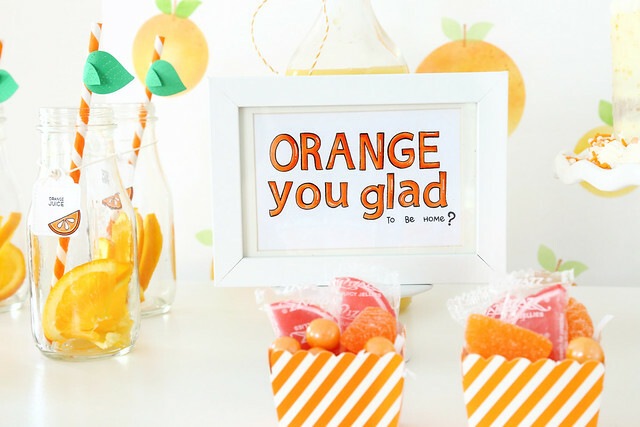 The striped straws only needed some die-cut leaves to carry the orange theme! I found these perfect little orange slice pouches at Michaels on liquidation for a dollar each. So good, right? I created a little tag, colored the centers orange and added another leaf. The cake was my labor of love for the week. I followed this recipe from The Cake Blog and it was delicious. My parents and in-laws especially loved it. My kids said: so good, but next time something with chocolate, ok? ha. 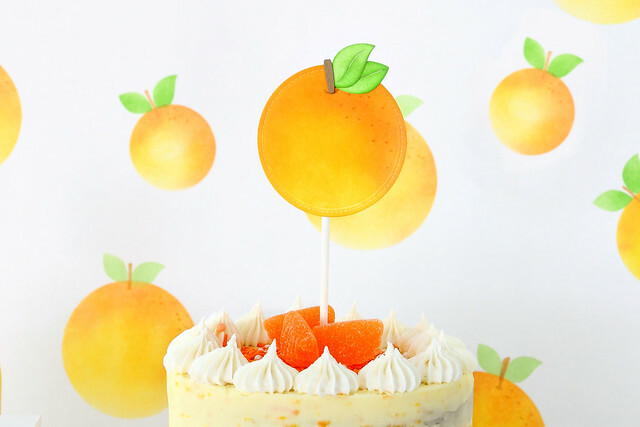 I created a simple, but effective cake topper using a circle die and a set of leaf dies. I hand-cut a brown stem, and added some accents using a brown copic marker. 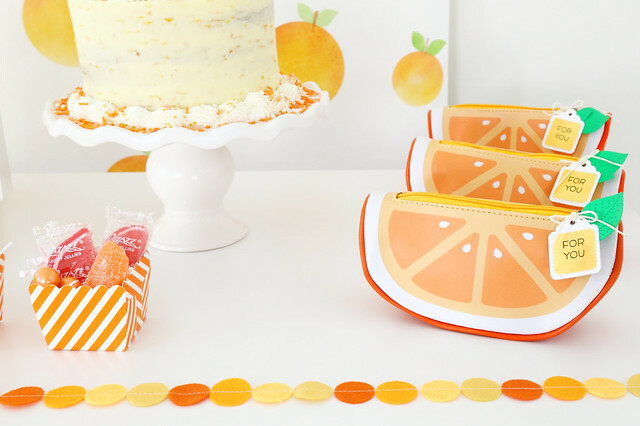 Hop on over to the Lawn Fawn blog to see how I used the negative circle and leaf die-cuts to create a sponged orange backdrop. As I was setting up, my sister asked where I got the perfect orange wrapping paper - woot! She thought it was store-bought and it took under 30 minutes to pull together.